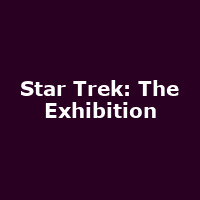 "Experience Star Trek as never before in this extraordinary exhibition marking the 50th Anniversary of the most enduring science fiction franchise in history. Follow the journey of Star Trek from the very first TV broadcast in 1966, through all 6 television series and 12 feature films. With a replica of the U.S.S. Enterprise bridge, original props, costumes, models and sets, the exhibition brings together a unique collection of genuine and original Star Trek artefacts."